We’d love your help. Let us know what’s wrong with this preview of Does God Play Dice? by Ian Stewart. To ask other readers questions about Does God Play Dice?, please sign up. Be the first to ask a question about Does God Play Dice? This book is a solid, interesting and insightful introduction to Chaos theory (the relatively recent and fascinating branch of physics that deals with the study of nonlinear dynamical systems exhibiting extreme sensitivity to initial conditions, in which seemingly random complex behavior can derive from simple deterministic, innocuous-looking equations). The material treated by the book is pretty standard for a good introduction to the subject: I think that it could actually be used as a supporting book for a non-mathematical undergraduate course in the subject. It would also be valuable reading for a course in the philosophy of science, as it contains, in a few places, fascinating discussions about the scientific method, about the contrast between the paradigm of modelling through partial differential equations and the methods of chaos theory, about the real meaning of complexity and of randomness and the challenges posed by chaotic behavior to the experimental verification of mathematical models, and other similarly interesting subjects. Overall it is a quite enjoyable book, written with conceptual clarity, and one of the very few books about chaos theory that at least attempt to seriously get into the more subtle conceptual elements of this discipline. However it must also be said that the subtitle “the new mathematics of chaos” is misleading - this is not a book about the mathematics of chaos, but it's more about the conceptual features of the phenomenon. But, even if devoid of mathematics, it can be really fully appreciated only by readers who had some prior knowledge of basics of topology and of partial differential equations. From this perspective, it really leaves you wanting for a more mathematical, quantitative approach – and this is quite unsatisfactory – this book could so easily have been a real gem. The lack of mathematical detail is occasionally frustrating (for example: Lorenz simplified mathematical model for atmospheric convection is shown, but there is no explanation of how these three differential equations are derived, nor any explanation of what the variables in the equations actually mean; another example: the concept of fractal dimension is introduced, but no mathematical detail is presented; even relatively simple examples like the driven oscillator or the double pendulum are not treated mathematically – something which the author could have at least done as a separate item in an appendix at the end of the book). Before we start with the review, let's take a moment to appreciate how good of a science communicator Ian Stewart is. Now on with the nitty gritty. When faced with accepting Quantum Mechanics, Einstein famously said: "God does not play dice with the universe", to which Stephen Hawking wittily replied: "Not only does God play, but he sometimes throws them where they cannot be seen". Quantum Mechanics, you see, cannot be handled with simple every day linear mathematics. Instead we attempt to explain Before we start with the review, let's take a moment to appreciate how good of a science communicator Ian Stewart is. When faced with accepting Quantum Mechanics, Einstein famously said: "God does not play dice with the universe", to which Stephen Hawking wittily replied: "Not only does God play, but he sometimes throws them where they cannot be seen". Quantum Mechanics, you see, cannot be handled with simple every day linear mathematics. Instead we attempt to explain it using probability. The reason behind this is chaos. Chaos may not be apparent in the overview of things, but when the smaller details add up, chaos becomes the main force behind them. It is the reason why so many behaviours seem unpredictable, or even random. To understand chaos, we cannot rely on classical linear mathematics, in fact just to glimpse it mathematicians had to become absorbed in the world of topology; a world of saddles, sinks, sources, and attractors; where a hole is not the lack of something but is in itself something (I love that!). I admit that before reading this book I underestimated topology, thinking that it could not rival calculus, statistics, and probability. But once I was asked to visualise an object in four dimensions, let alone fix or six, I understood my own ignorance. In the end, what we end up with is that chaos is not only unpredictable, but also stable; making it one of the most dazzling paradoxes around. Now enough about chaos and topology, let's talk about the book; after all that's what a review is for. Now, can you read this book without an advanced background in mathematics? Yes, I did. Will it be easy? Not particularly. The larger part of Does God Play Dice is conceptual. You have to put in an effort. If I had to compare this book to something, I'd say that it's close to an introductory course on chaos. It explains a whole lot, but it leaves you with so many questions. The best aspect of this book is that some of the most difficult things to understand are explained clearly with Ian Stewart's subtle sense of humour. And so even when I had my eyes closed trying to visualise something, like attractors, or writing down notes on the Butterfly Effect ( which is pretty useful to me), it was still fun. Challenging, but fun! Best of all, the book prepares you to read more about chaos. Because let's face it, when you finally finish this book, you're going to have one of two reactions: either "Wow, I'm so glad I read this! I need to learn more about chaos!" or "I don't even want to hear the C word again! Now where's the aspirin?". Fortunately for me, I had the former reaction. Some chapter were fantastic (chapter 16 comes to mind), others, like the pendulum chapter, could have used more "bling". So would I recommend this book? Yes, definitely. But a word of advice: take your time with it. Let the new concepts sink in first. Don't rush through it; read the sentence (or the chapter) multiple times if you have to, until you get it. Because once you do, it's worth it. What a great introduction to chaos theory! This book is not only well-written, but it's also incredibly interesting. It's stunning and intriguing review of nonlinear systems (chaos), from countless real world perspectives. Stewart's humorous and engaging writing style makes the book a pleasure. He starts from simple mathematical equations and simple physical systems such as pendulums and turbulent water, and routinely takes the idea out to cutting edge research or engineering possibilities. Now I know what math textbooks and areas of study to proceed to, and Stewart has given mea geometric ability to visualize, It's stunning and intriguing review of nonlinear systems (chaos), from countless real world perspectives. Stewart's humorous and engaging writing style makes the book a pleasure. He starts from simple mathematical equations and simple physical systems such as pendulums and turbulent water, and routinely takes the idea out to cutting edge research or engineering possibilities. A readable and witty introduction to chaos theory, which is only too misunderstood. This book focuses on the implications which chaos has in mathematics, with an emphasis on maps, fractals, and other such phenomenon. A solid layman introduction. At times a bit technical, this is indeed an intriguing book, a passionate account of Stewart on chaos theory and how endless applications and uses it has. I really enjoyed it, and recommend it to anyone to challenge your perspective on how things happen in world. This book really gets into the theoretical stuff that was missing in Gleick's book on chaos. It still doesn't go heavily into the math but I struggled with some of the more technical material. I will certainly come back to. Stewart is a gifted expositor. Nothing particularly new, but I guess I've read enough of these now that that was pretty likely. It's a very good overview of the whats and whys of chaos theory, comparable to Gribbin's Deep Simplicity, though maybe slightly less accessible. The final chapter is marred by an ill-conceived rant at a straw man of reductionism, but nobody is perfect. A good introduction to chaos. It’s rewarding both as a mathematics book and a philosophical inquiry of the nature of our relation to knowledge of the natural world. This relation is established through the human language of math. Um excelente livro sobre o Caos. Esse livro fez-me recordar sobre a formação de Engenheiro de Controle de Processos, versando sobre inflexões, pontos de sela, autovalores (eigenvalues) e outros aspectos fascinantes à existência de um ponto de equilíbrio ou tendente à instabilidade. Deve ser lido como um livro de idéias, sem as fórmulas matemáticas complexas para determinar se um ponto leva à instabilidade ou não, além das questões da passagem de um mundo analógio (mundo real) para o digital (compu Um excelente livro sobre o Caos. Deve ser lido como um livro de idéias, sem as fórmulas matemáticas complexas para determinar se um ponto leva à instabilidade ou não, além das questões da passagem de um mundo analógio (mundo real) para o digital (computadores). The best mathematical models for many physical events rely on chaotic formulas and the number continues to grow rapidly. It now appears that some exposure to chaos and fractals will be a necessary component of the education of all future applied mathematicians. Given the simplicity of many of the equations, it can be strongly argued that chaos should be an early component of all mathematics education. Also, programming a computer to generate the images is very simple and a lot of fun. To study ch The best mathematical models for many physical events rely on chaotic formulas and the number continues to grow rapidly. It now appears that some exposure to chaos and fractals will be a necessary component of the education of all future applied mathematicians. Given the simplicity of many of the equations, it can be strongly argued that chaos should be an early component of all mathematics education. Also, programming a computer to generate the images is very simple and a lot of fun. To study chaos, you need a place to start, and this book will point you in the right direction and give you a brisk tail wind. The author, best known for his mathematics columns in Scientific American, writes with exceptional clarity. There are very few equations, as Stewart relies extensively on the verbal explanation. While computer generation is mentioned, only one very short BASIC program is given. The material is pretty standard for introductory chaos and could serve as a textbook for a non-mathematical course in the subject. It would also be valuable reading for a course in the philosophy of science. Fairly extensive historical backgrounds are given for many of the initial discoveries. If you have heard about chaos and want to know what all the excitement is about or are looking for reading material for a class you are teaching, this book is an excellent place to explore. Published in Journal of Recreational Mathematics, reprinted with permission and this review appears on Amazon. Chaos represents the third great scientific revolution of last century, after Einstein's relativity and (among the earliest) Plank's and Nernst's quantum field theory. As the others two, chaos is endowed with a veil of mistery and fantasy and remoteness, though appealing in this case, even though its rules are by now quite known and its growing applications are very disparate. This notwithstanding, chaos remains more a curiosity or an abused metaphor among college students, not talking about you Chaos represents the third great scientific revolution of last century, after Einstein's relativity and (among the earliest) Plank's and Nernst's quantum field theory. As the others two, chaos is endowed with a veil of mistery and fantasy and remoteness, though appealing in this case, even though its rules are by now quite known and its growing applications are very disparate. This notwithstanding, chaos remains more a curiosity or an abused metaphor among college students, not talking about youngsters, while it should have all rights to belong to high school curricula even. This because it is very interesting and essentially easy to understand if well presented. And it is highly entartaining. Ian Stewart has produced more than two decades ago this good popularization, an introduction to non-linear system dynamics for laymen, naming it after a reputedly Einsteinian sentence which, truth said, was originally referred to the epistemic a-causality that quantum mechanics seemed to purport and that he did not digest (not till its very late years, that is). Stewart's is a real introduction to chaos facts and its manifold ramifications (maps, weather forecasts, maths), as compared to the more famous yet more gossipy "Chaos" by Gleick, which deals more with the epic history of the development of ideas behind chaos theory. Ian explains in, I think, a very accessible way the mathematics of "Chaos". I found the selected examples simple enough and yet compelling and I liked the stories about the scientists who pioneered the field. Ian also outlook various applications of chaos theory to practical issues, including spring manufacturing. A very nice introduction, which I recommend to those, like me, who run away when Greek symbols show up. 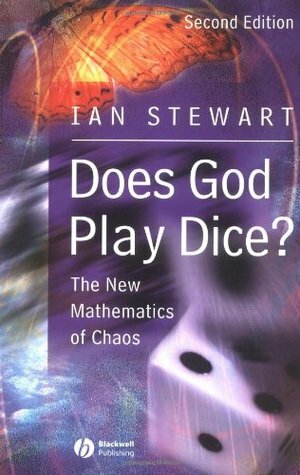 I eventually did not understood whether God plays dice or not, but the I learned Ian explains in, I think, a very accessible way the mathematics of "Chaos". I found the selected examples simple enough and yet compelling and I liked the stories about the scientists who pioneered the field. Ian also outlook various applications of chaos theory to practical issues, including spring manufacturing. More Mathy than Chaos but covering much of the same ground. An excellent introduction to the wonders of phase space, and there's a fantastic little bit about Pointcaré near the beginning. Stewart's kind of a cad, though. Entertaining and clearly the basis for a lot of modern understanding of the concept. I highly recommend it for anyone who wants to brush up their own mathematical knowledge. It's an older book with added chapters, and could stand to be updated to be a bit more contemporary in terms of the modern implications of its subjects, but that's a tough compromise to manage: get too meaty and you lose accessibility. Still, I'm picking up another Ian Stewart book now. Lovely introduction to chaos and its discovery and applications in nonlinear dynamics. The style of writing is accessible but not patronising, and there is a nice amount of Ian Stewart's wit scattered amongst the pages. It focuses more on chaos than the quantum mechanics the titular quote refers to, but there is a chapter on QM at the end. It is a very good read for people interested in chaos and how the world really works. A good introduction to chaos theory, and some of the mathematics behind it, and possible applications. Topics include strange attractors, self-similarity, and fractals. The book includes some helpful illustrations. The book seems to go into a bit more mathematical detail (some actual equations) than a typical book about chaos theory for a general audience. This particular edition of the book seems to be a bit out-dated in some places (given that it was published in 1990). excellent introduction to chaos theory and nonlinear dynamics, including their relationship to topology, history of discovery, and projections into the future. in particular enjoyed learning about poincare sections and how they relate to phase portraits and attractors. also chaotic control (von neuman's dream). A great and lean introduction to the topics of non-linear dynamics and chaos. Ian Stewart is an excellent mathematics popularizer. The book offers multitude of examples of nonlinearity's existence and utilization which quickly segway to how the mathematical theories explaining them were created. I recommend this position to anyone casually interested in mathematics. Read this and one other book on Chaos theory. The author misrepresents Einstein's theories at many points in the book, i presume in order to promote his own relativistic views as if they were supported by Einstein himself. Ultimately, it reads like a book whose author didn't fully understand the topic at hand. Not my cup of tea, but very interesting indeed. Some concepts are hard to follow for a layman, but all in all, Stewart uses accessible language and lots of examples, so you get a general idea. I'd recommend it as an introduction to the subject. Ian Stewart writes many books, including this one, which cater to both mathematicians and non-mathematicians. Although, no mathematical knowledge is required, they are very insightful books and are a great bit of fun! You'll enjoy it if we can appreciate the ubiquitous mathematics in our world! Really good book about chaos, which behaves in not yet understood way, but somehow beautiful and orderly. Beautiful paradox in maths. Superb, even for a lay reader. Enchanting. I liked it. Very fun to read, quite challenging. Ian Nicholas Stewart is an Emeritus Professor and Digital Media Fellow in the Mathematics Department at Warwick University, with special responsibility for public awareness of mathematics and science. He is best known for his popular science writing on mathematical themes. Librarian Note: There is more than one author in the GoodReads database with this name. See other au Ian Nicholas Stewart is an Emeritus Professor and Digital Media Fellow in the Mathematics Department at Warwick University, with special responsibility for public awareness of mathematics and science. He is best known for his popular science writing on mathematical themes. 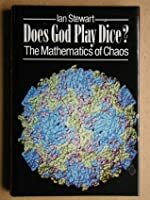 Quotes from Does God Play Dice?